3 NEW MOVES – Strapping one on to invent the wake front roll, air wrapped 360, and Skidder. 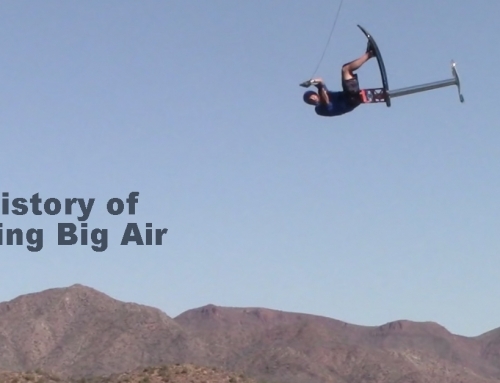 SHOOT TO KILL – A near-death experience while on location for Air Chair’s first video. TIE HIGH – The development of the extended pylon for bigger air. Skylon & Air Boom. INNOVATIONS – Modifications and new designs from the few few years of foiling. 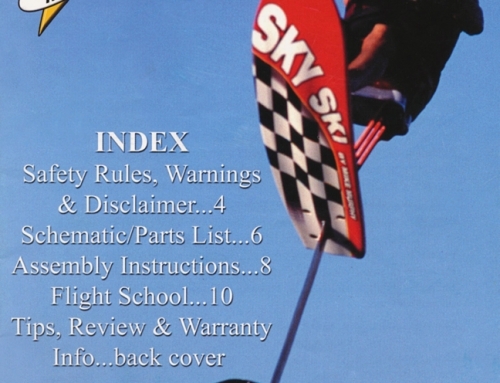 FLY-IN’ – (1994) High times at the 1st Fly-In for hydrofoiling; on the Parker Strip of the CO River. LOVE TO CRASH – Developing new moves on the way to 200,000+ crashes. ON THE RECORD – 147 > 254 > 708: Extending consecutive flip record with some “sibling” rivalry. WELCOME TO MY WORLDS – Competitions: the first Worlds, Pro Tour & 1,416 flips in a row. FLIGHT HYDROFOILING NEWSLETTER – Covering the golden years of foiling. YOU’RE FIRED – The bitter breakup between Bob Woolley and Mike Murphy. 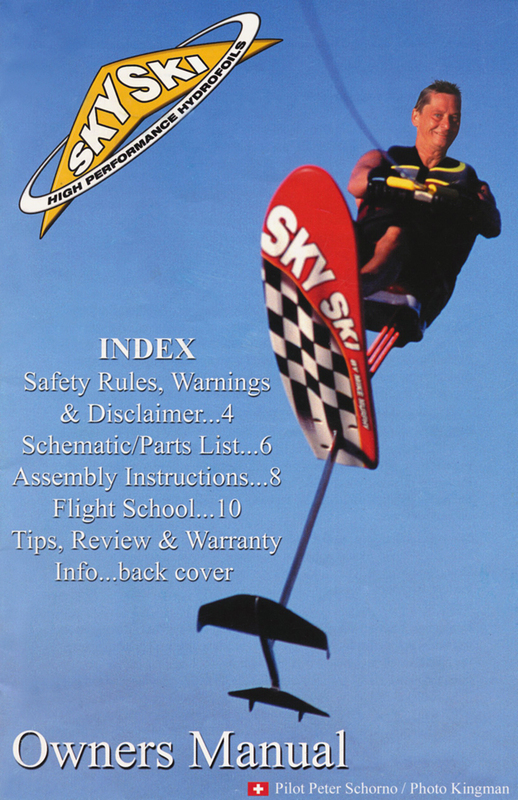 SKY SKI – Seven years of intense foiling innovations and promotions with Mike Murphy. 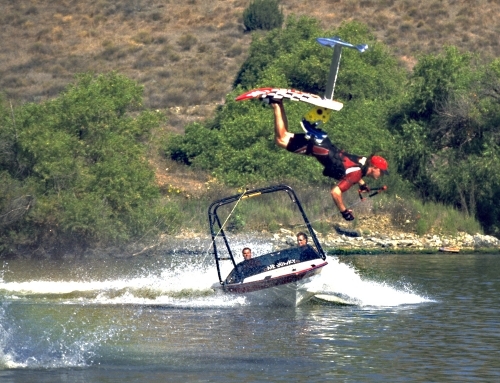 STAND UP GUYS – Hydrofoiling + standing up sideways = air board / foil board. UNORTHODOXY – Double the fun. IT’S THE CHEESE – Ron “Air Boom” Stack is a Gouda example of how to be cheesy. TRIPPIN’ WITH SCHÖRNO – Lifestyles of the Rich and Famous…and Hydrofoiling! Cover Image: “Adventures in Water Skiing: Part 3, Hydrofoiling,” photo: Ian Lauder, 1999. Some Rights Reserved. The TEXT ONLY of this publication MAY be used or reproduced in any manner whatsoever without written permission. 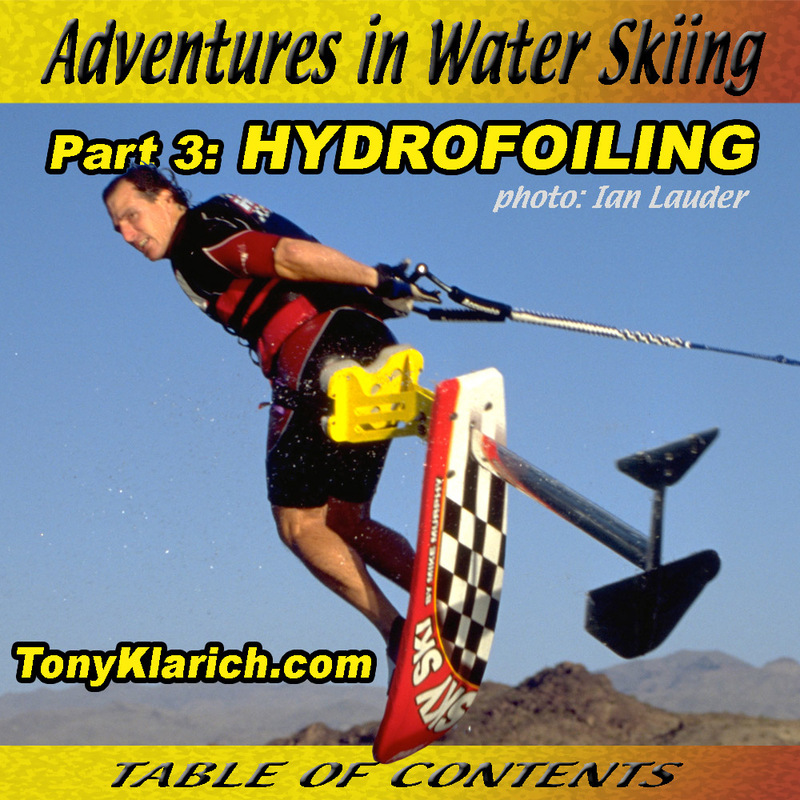 All use MUST be accompanied with the attribution: “From Adventures in Water Skiing: Part 3, Hydrofoiling. Used with permission by http://tonyklarich.com”. TEXT ONLY is licensed under creative commons agreement (CC BY 3.0). The images (photos) MAY NOT be used, uploaded, reposted, or reproduced in any manner whatsoever without written permission. PREFACE: NOTE TO THE READER When I first announced this project a friend asked why anyone would be interested in reading a book about me. Now I’ll have to admit that did hurt my feelings, but I thought hard about it for a couple of days, and came up with what I think is a good answer. My “glory days” in skiing corresponded with the explosion of watersports in the 1980s and 90s, including the creation and rise of hot dogging, kneeboarding, wakeboarding, and hydrfoiling. I had a front row seat to the exciting developments of each new sport as a pioneer and top competitor. Plus, I’ve already written hundreds of articles, and have a collection of thousands of photos and videos. The point is that my personal story is also the story of these sports, how they developed, and how they relate to each other in the bigger picture. The longer format of a “book” has allowed me to dig deeper into the history than ever before. We’re far enough away from the rise of hydrofoiling to get some historical perspective, but not so far to have lost touch with the innovative personalities directly responsible for creating a whole new way to ride. 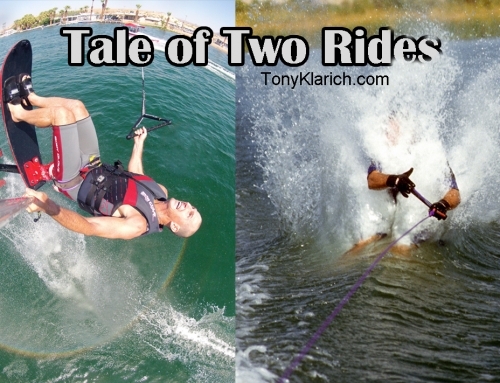 The recent media developments have also allowed me to present Adventures in Water Skiing in a brand new way. To my knowledge, this is the first interactive electronic book to document the history of waterskiing. Anyone can download it instantly for FREE. This interactive ebook is embedded with dozens of photos and scores of links to magazine articles, timely websites, and classic videos. On a final note, it is very important to me that this body of work stands as a respected historical record for water skiing. I have worked extremely hard to get the facts straight, and tell each part of the story with as much research and insight as possible. I hope that future generations who read these words can find a source of credibility, insight, and of course, entertainment. Mom & Dad: endless support to follow the dream. A complete list of individual photos by specific photographers and publications (with dates) can be found at the end of the each chapter. 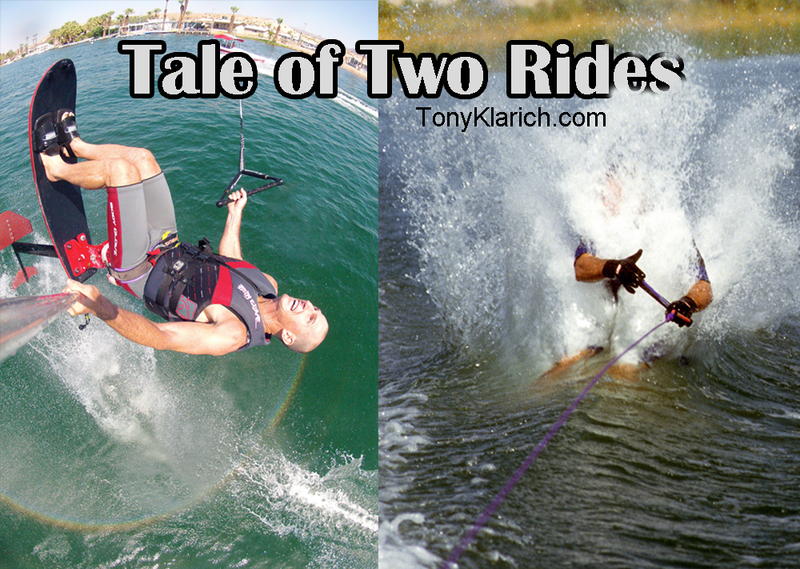 I have and will continue to make every effort to create a story that reflects how water skiing has developed, especially in the disciplines of hot dogging, kneeboarding, wakeboarding, and hydrofoiling. This book is the result of thousands of hours of research. It involved reviewing hundreds of water skiing publications, conducting numerous interviews with industry insiders, and having access to the extensive research library at the Water Ski Hall of Fame. Every effort has been made to make this book as complete and accurate as possible. However, there may be mistakes, both typographical and in content. If I missed something important (storyline / timeline / photo / link), please let me know through my website: http://tonyklarich.com. The non-printed nature of this document will allow me to make corrections and improvements, and then upload the new edition.